I say it every time I go there, but it’s true: Chicago is my kind of town. And my trip over the past few days was definitely one of the best yet. Sure, I do some of the same things whenever I’m in the Windy City (hello, Bean), but I haven’t had the same agenda twice. There’s always something new and different to do. 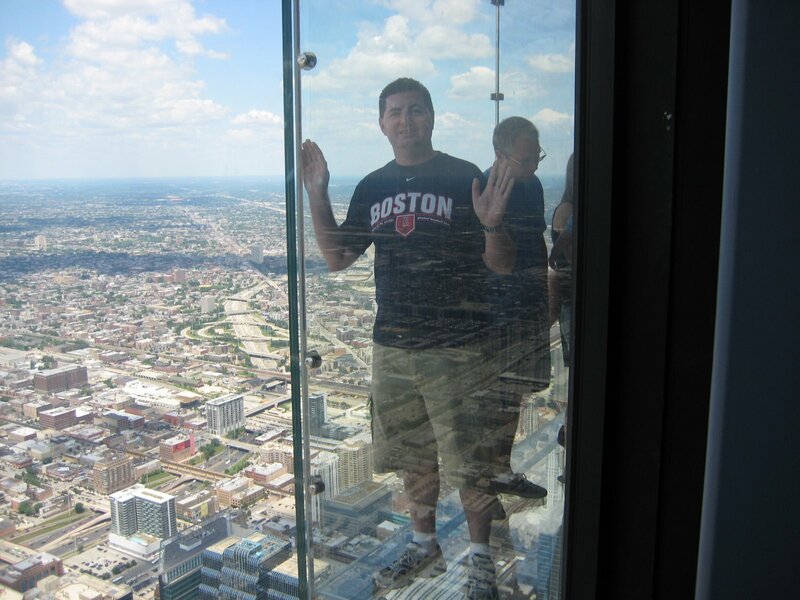 For example, although I’d been to the Sears Tower — ahem, I mean the Willis Tower — before, this trip I got to experience the Ledge, which you’ve seen me mention on this blog. Suffice it to say, it didn’t disappoint. I mean, it’s not like the Ledge is an action-packed thrill ride or anything — in fact, it’s kind of just there, with no extra signage or anything — but it is pretty cool, and given that I went on a day with perfect weather, it made for a fun time and some great pictures. That was definitely a highlight of the trip. 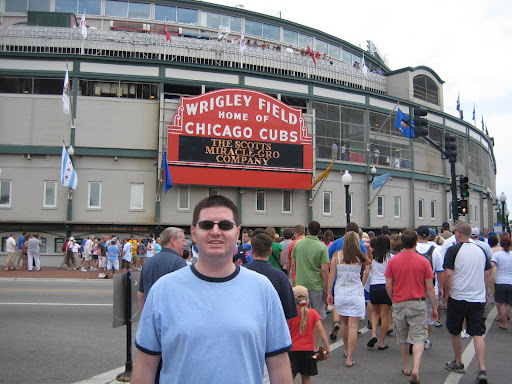 Also a highlight was my first trip to the friendly confines of Wrigley Field, where I saw the Cubbies beat the Milwaukee Brewers. It was a much more low-key experience going to a game at Wrigley, which I say because it was an afternoon game and though we had seats in the upper deck (section 516), Andrew and I moved around a bit and were able to sit in various seats in the field box and 100 levels. You can’t do something like that at Fenway; there are too many ushers there, and the games are always sold out, with nary an empty seat to be found. Other “new” things for me this trip were a trip down the Chicago River on an architectural boat tour, experiencing the chaos of the Taste of Chicago, watching the fireworks on Yuntiff (i.e., the night before the holiday, on July 3), and a few trips on the El. And of course, I took plenty of pictures while I was there; you can see them here. 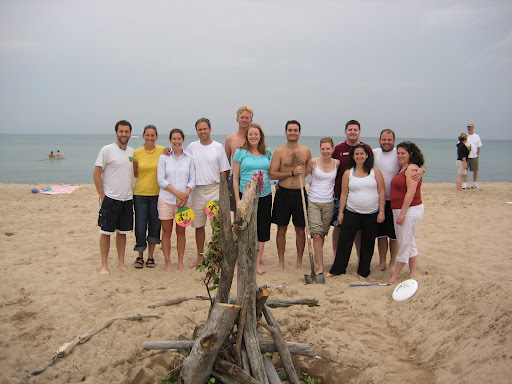 The reason I went out this week, though, was because I was invited to Andrew’s wife Rachel’s family’s beach house on Lake Michigan … in Michigan City, Indiana (which, I learned after the fact, is not a red state). There are many longstanding traditions at the house, including labeling your plastic cup and not getting another all weekend, the serving of Drunken Salami (i.e., salami that’s been marinated for a couple months in Scotch and Russian dressing) and the awarding of a Salami King/Queen, and a great bonfire on the beach with family-bought and family-lit fireworks. You know how I feel about being in Boston on the Fourth, but I have to say, sitting there on the beach Saturday night watching all the fireworks going off (not just ours), and having a sing-along with the gang, after eating delicious barbecue, playing some beach volleyball, and watching an amazing sunset, I decided this was a perfect Fourth of July. And as if the weekend couldn’t get any better, one other tradition is a stop at the local Dairy Queen on the way home. If you’d like to see pictures of just the Fourth of July weekend, click here (Note: it’s a separate album from the other Chicago pics). True enough. Chicago is one town that never lets me down.